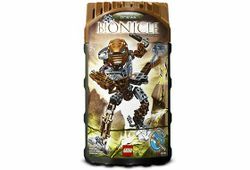 8739 Toa Hordika Onewa is a BIONICLE set released in 2005. He was one of the Hordika. Onewa possesses two Claw Clubs and a Rhotuka Spinner and Launcher. This is a description taken from LEGO.com. Please do not modify it. (see an archive of the product's page) Heart of stone! Includes instructions to build a Rahi rock raptor with #8739 and #8740! The spinner is launched by pulling the ripcord. Facts about "8739 Toa Hordika Onewa"